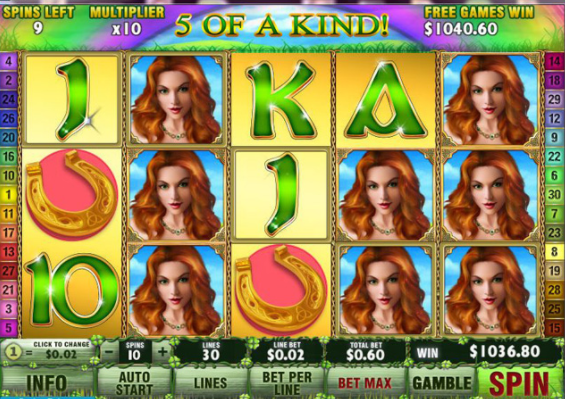 Heres a superb new online slots game from Eyecon gaming. 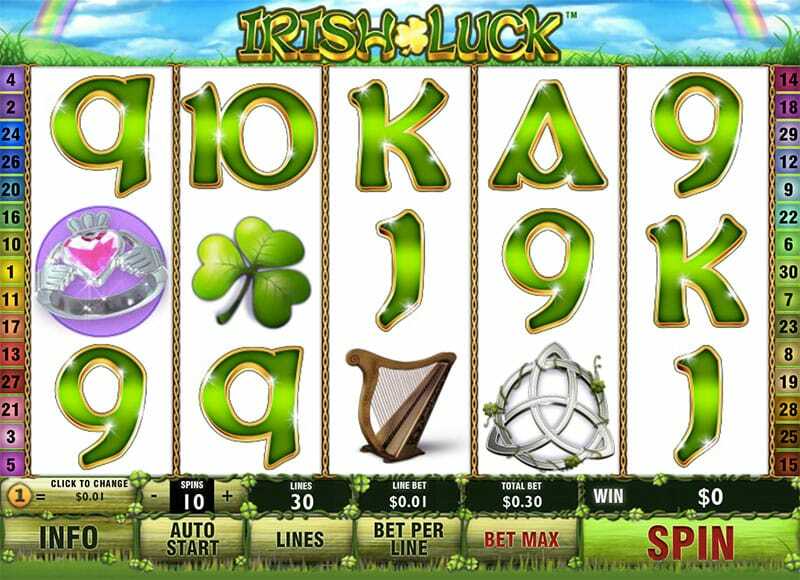 Chase the rainbow’s end and your own pot of gold with the Irish Luck online slot game. Ireland is a land of charm, myth, magic and mystery, and its ancient, historic locations echo with tales of Leprechauns and Faerie Folk, and the strains of traditional ceilidh music. According to legend, Leprechauns live in remote, rural places, as they are shy of people. Much like the Hobbits in J.R.R Tolkien’s Lord of the Rings, they are said to live in underground burrows or caves, with hidden entrances. Others believe they live in the hollowed-out trunks of Fairy Trees, hiding from people who might wish to capture them to make them grant wishes. The Leprechauns in Irish Eyes, however, seem friendly and jovial, and more than happy to grant the player’s wish (if that wish happens to be a game overflowing with character, and winning opportunities)! ‘Irish’ and ‘luck’ are so inextricably linked in people’s minds that they’re almost synonymous. Irish iconography has such strong associations with luck, and the promise of wealth, that slots developers have drawn upon this theme as inspiration frequently. Irish Eyes stands out amongst the rest, however, with its elegant artwork, clever subtleties and air of intrigue and mystery. Eyecon’s uncluttered and accessible games are sure to provide a simple and intuitive gateway to online slots for players who favour land-based gaming. Though their designs are beautifully realised and absorbing, their solid, rewarding slots bonus features take centre-stage, which makes for an outstanding level of player-satisfaction. Irish Luck has a vivid cartoon style that makes its visuals a real selling point. Behind the reels, we can observe a verdant backdrop of green trees, hills and fields, and towards the foreground, a prominent arcing rainbow, almost close enough to touch. There are an astounding variety of symbols, so many, in fact, that each spin is a pleasant surprise. The symbols stand out boldly against deep green reels, particularly as lots of them are encapsulated in sharp-edged disks. There are pots of gold disgorging rainbows, small, proud-looking castles atop hills and trees stuffed with golden coins. That’s not to mention the gold-lined pavements, beautiful-but-dangerous red and white Fly Agaric mushrooms, rainbows emerging from behind trees, and foamy mugs of dark brown ale, that look good enough to drink. PRIZE PICK – if 3 or more smiling Leprechaun SCATTER symbols appear, the player receives a prize pick for each. Should the pick reveal a Leprechaun, he will award you 10 free spins. The Fairy will bestow a prize of up to 100x the total wager. MATCH AND WIN – 3 or more Fairy SCATTER symbols will trigger this entertaining feature, in which the player selects four-leaf clovers until they reveal a pair. They will then win the value of their matching pair multiplied by the total wager, for each fairy symbol in the triggering combination. If your fairies are plentiful, this can prove a richly rewarding bonus. WILDS – Four Leaf Clovers act as WILD symbols, standing in for all symbols apart from the Leprechaun and Fairy SCATTERS. They appear in the second and fourth reels, and also cause a prize to be doubled when the substitute symbol appears in a win line. GAMBLE – this bonus gives you the chance to take away double or nothing on your last win. Pick the luckier of two choices, and continue to do so until you choose to take your win, or you choose incorrectly. You can make a maximum of five picks, and your wins can reach £32,000 before the feature ends. However, if you reach £32,000, it’s unlikely you’ll be too disappointed at the feature cutting out. The sound effects are minimal, but all the more effective for it, making large game events stand out as special. An arcade style electronic trill announces win lines, and the Match and Win bonus has a cheery whistle-type soundtrack, which marks the interlude well. Small animations catch your attention, such as Leprechaun SCATTERS, which will give you a congratulatory wave and toss gold coins in your direction. Fairies will blink, wide-eyed, fluttering their eyelashes along with their gossamer wings, and the perspective will zoom out to reveal they are clutching a large gold coin as one might hold into a purse. The interface of this game is streamlined and simple to use, with an orderly, intuitive layout. You can press the Autoplay button to set between 10 and 100 automatic spins, and click on the stack of coins icon to quickly adjust the number of lines, and your bet. The question mark icon provides fast access to information on features, symbols, paylines and game rules, for handy reference. There is actually a follow up to this game which you can go and check out. Called Irish Luck Jackpot, which is a progressive jackpot, the value of which increases over time. Until eventually one lucky player triggers it and recieves a huge cash prize. This game encapsulates the spirit of the Emerald Isle, and sparkles with Irish charm. Its delightful graphics make the game a joy to look at, and its feature-rich gameplay keeps games bubbling with the energy of a dozen leprechauns on a sugar high. Any player is sure to be entranced by the delightful mythical creatures that populate the reels of this slot, and be seduced by the winning magic of pink pixie-do-haired fairies, and cheerful, generous leprechauns. So, put on your best green trousers or skirt, slide down the rainbow, and prepare yourself to land smack-bang in the middle of the deep, delightful pot of gold that is Irish Luck. If you enjoyed Irish Luck then you might also like Stampede.